For anyone who has a pontoon boat you know how hot it can become while you are fishing or simply relaxing. This is where a Taylor Made Products Easy-Up Gazebo Shade Top comes in handy. An Easy Up Gazebo is a really quick and easy way to give yourself and your fishing buddies some additional shaded area while out on your pontoon boat. These shades are manufactured from hot shot marine grade polyester fabric, which it both strong and lightweight making it easy to handle. The shade is fits over a fiberglass pole frame which can be broken down for easy storage. The Easy Up top fits boats that 96″ and 102″ in width and it extends out giving you 8′ of coverage. 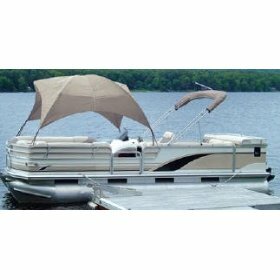 So make sure you are ready for the summer fun and relaxation days by getting your Taylor Made Easy Up Shade for your pontoon boat.